There is a segulah from the Kozhnitzer Maggid to recite three well-known stories (reproduced below) related to Pesach, (usually on the Shabbos when we bless the new month of Nissan). The segulah is that the stories will bless the Jewish people with an abundance of provisions and necessities for the upcoming Pesach. 1.) A certain Jew was selling brandy before Pesach, to provide for the upcoming holiday expenses. He went from country to country, but at one border, the guards seized his barrel, since he lacked the proper licenses. The Jew quickly traveled to the Rebbe Reb Meilech and poured out his heart. The Rebbe Reb Meilech told him to tell the guards to taste the contents of the barrel; it was only water. The Jew did as the Rebbe had told him. They were surprised to find that the Jew was telling the truth! They returned the barrel to him, but then he went back to the Rebbe, crying: "Now how can I provide for my family for the holiday? The barrel of brandy was my only way of earning a livelihood and now it's full of water!" The Rebbe Reb Meilech told him to taste the contents of the barrel. To his delight, it was full of brandy once again! And the Jew had all the neccesities for Pesach in abundance! 2.) A king lost his ring. He proclaimed that he would pay a handsome salary to everyone who searched for it. There was a poor Jew who had no money for Pesach. His wife advised him to take up the king's offer. So he joined in the search, and with the money he earned, he bought all the necessities for Pesach. This Jew was also a generous fellow; he invited many guests for the seder that year. Among the king's advisors was a wicked anti-Semite. On the seder night he went to the Jew's home and peeked in through the window. When he saw the Jew eating and drinking and not searching for the king's ring, he saw his chance. He quickly went back to the palace. "Your Majesty," he said. "You've been fooled. I'll show you!" The king followed his advisor to the house of the poor Jew,and peered in the window. There was the Jew at a table full of guests, eating and drinking like a king! Still, the king was loath to think ill of his Jewish subject. He told the advisor, "This Jew is probably interrogating these men to see if they know the ring's whereabouts." This Jew's custom was that at "Dayenu," he would recite each verse and all the guests would respond, "Dayenu." It so happened that the advisor's name was none other than Dayenu. Just then, they all answered in chorus "Dayenu!" The king's advisor paled. The king understood this to mean that his trusted advisor had in fact stolen the ring. He commanded his royal guards to seize the advisor and jail him, and he confessed to the crime. And the Jew had all the neccesities for Pesach in abundance! 3.) There was a certain Jew who worked hard for his landlord, the poritz. One day, the poritz said, "It's lucky for you that I support you. Otherwise, you would starve!" In his simple faith, the Jew answered, "What are you saying? There's a G-d in Heaven and He provides for all His creatures. 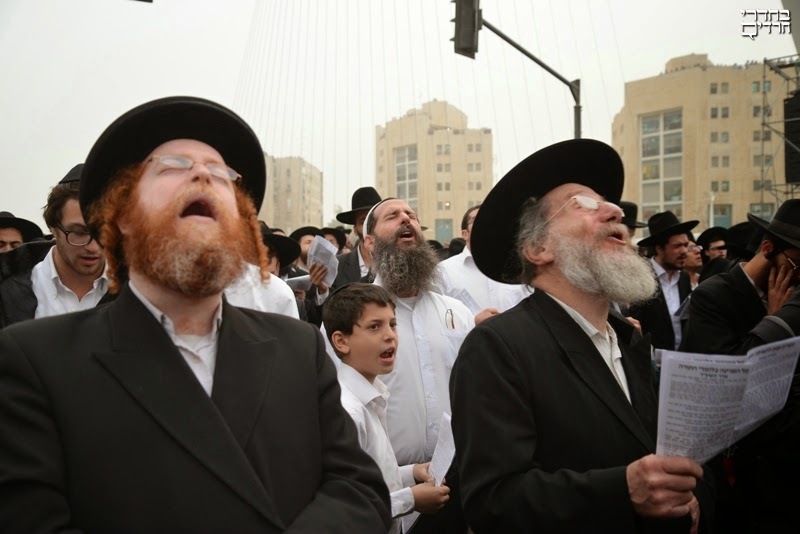 If the poritz won't serve as G-d's agent, G-d will find me another." The poritz angrily banished the Jew from his property. This occurred right before Pesach. This poor Jew now had no money to buy the necessary provisions. The poritz had a huge treasury where he kept all his gold. He would go in from time to time to count and polish his coins. He would spit on each coin and then polish it till it shone. The poritz' pet monkey would go with the poritz into the treasury and watch him. He saw his master put the coins close to his mouth; he thought that the poritz was eating the coins! Monkey see, monkey do. The monkey copied his master. It stole alone into the treasury and feasted on the gold coins. The monkey ate so many coins that it died. When the poritz came into his treasury and saw the dead monkey, he didn’t realize the cause of its death. His anger had not abated, and he commanded his servant to throw the monkey into the Jew's house, to teach him a lesson. "If I don't provide for him, no one will!" The servant threw the monkey in through the window. When it landed, its stomach burst and all the gold coins came pouring out. Then the Jew was able to buy an abundance of provisions for Pesach. On the seder night, the poritz sent his servant to see how the Jew was suffering without food. But the servant reported that the Jew's house was full of food and drink. The poritz later sent for the Jew and asked him from where he'd had money. The Jew told the poritz how someone had thrown a dead monkey into his house and that hundreds of gold coins had burst from it. The poritz then admitted, "Now I truly see that it's Hashem Who provides for us all." And the Jew had all the neccesities for Pesach in abundance! May you all be blessed with abundant resources for a Freilicha and Kosher Pesach, May your tables abound with guests who enlighten your seder with gems of Torah, May you and your children and your children's children not know from want all of your days, May your seder table be blessed with the visable revelation of Eliyahu haNavi in preparation for the coming of Melech Moshiach. So why did you go ? Many people who know me know that I never attend protests, I just dont go. So many of them were surprised to hear and "see" that I went to this one. Well the truth is at first I didnt intend to. But as the day wore on and "everyone" was going I felt left out and when my boys came home and said Tatty, how come youre not going when all the gedolim said to? I felt that for the sake of good chinuch alone I should show them that their Tatty listens to our rabbis and accepts their authority and I like Jewish unity and this was a prayer rally not a demonstration and so I went. There was tremendous unity and it was very moving to be a part of such a presence, there was electricity on the air. We said Tehillim, Selichos and davened. And we also sent a message saying united we stand, together diverse yet as one. We are am Yisroel in Eretz Yisroel only because the Torah has kept us alive through galus, and no Mr Netanyahu, Benet or Lapid can take that away from us. The arab cab driver who drove me for 20NIS from Har Hertzel towards the Jerusalem Gates asked me to what purpose I was going, and so I told him, they have decreed against us all, "and what can this rally do?" he asked me, I answered him, pointing my finger up towards Heaven and said, "we are helpless we cannot do anything only He can help us, only He can rescind or cancel this decree, and so we have to ask Him, we have to pray." He nodded seriously and said, "You are right I agree." The funny thing is that I actually saw many reporters they didnt look particularly religious so I had no idea to what use and under what headlines and with what captions the photos they were snapping away would be used for so I kept ducking behind my pamphlet of Tehillim, but I guess they caught me anyway when I was unaware! Just got back from Lizensk, (lezajsk) Poland where I spent the day knock knock knockin on heaven's door . 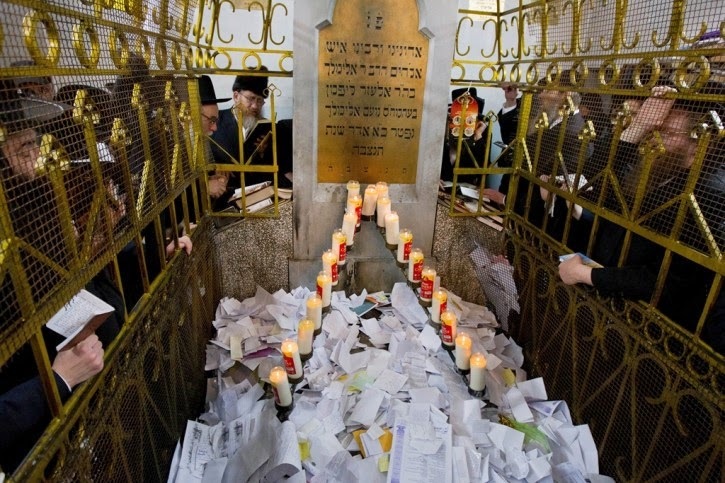 . .
davening, praying and reciting Tehillim at various kivrei tzadikim. "Vos far a niggunim iz deis?!" what kind of strange niggunim/music is he playing? as Axl Rose singing Guns N Roses "Knocking on Heaven's Door," poured out of the speakers, it hit me . . .
that was exactly what I was here to do. I had come to knock, knock on heaven's door, to ask Hashem to open the Shaare' tefillah and Shaarei Dima that cannot be ever locked. The effect was a kind of coming full circle, a kind of personal closure for me. and I thought to myself, no one else on this bus but me has any clue what that song means or what he is singing! Thats when it hammered the message home, no matter what my origins, upbringing or influences, so long as I could uplift myself to the right place and channel it all to the right direction thats what it was meant to be. . .
whatever nitzotzos, whatever sparks (if there were ever any) have been released, I came to knock on heaven's door by the Noam Elimelech, and be answered and poel a yehusha for all those who sent me on my trip and sponsored my way. The same kind of weird irony struck me as I walked back from the holy tzion of Rav Tzvi Elimelech author of Bnei Yissaschar in Dynow. As I walked back instead of walking back through the beis hachaim for some reason that only Heaven dictates, I walked out of the gate and walked up the dark path on the left. As I walked towards the entrance on my right bordered by the high cemetary fence I noticed something on the ground. Here in Dynow Poland lay a plastic bag emblazoned with the Hebrew logo Steimazsky, the Israeli bookstore and I thought to myself, how funny that wherever we all go we all leave some imprint something of ourselves behind. It can be a piece of trash like this Steimazsky bag discarded by some Israeli pilgrim come like me to daven here by kivrei tzadikim, it can be a song, knock knock knocking on heaven's door. . .what kind of imprint will you leave behind? thats the question to ask ourselves . . .